Use the on-screen guide to find shows and set up recordings quickly—just press the GUIDE button on your TiVo remote. The guide displays up to two weeks of programming. To view the guide, press the GUIDE button on your TiVo remote. 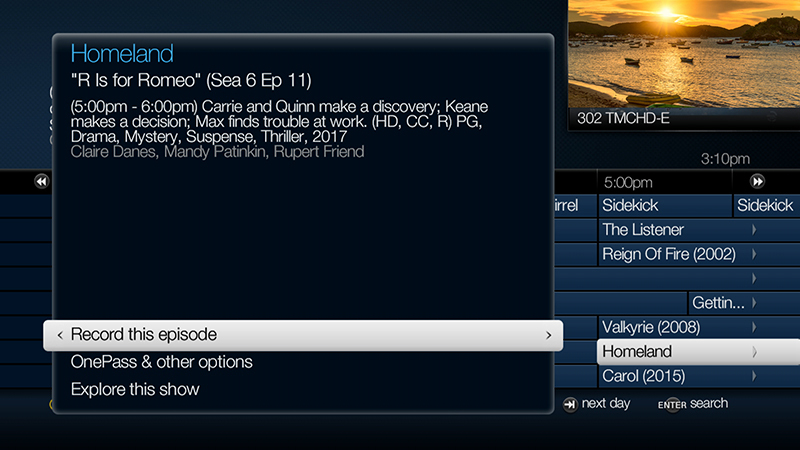 To view Guide options, like whether you want to view the TiVo Live guide or the Grid Guide. Press FAST FORWARD to move the displayed time ahead, or press REWIND to move it backward. Press ADVANCE to jump 24 hours ahead, or REPLAY to jump 24 hours back. Highlight a show's title in the guide, then press RECORD. On the screen that appears, select "Record this episode." After the recording is scheduled, you'll return to the guide. To find alternate airings of a show, highlight a show's title in the guide, then press RECORD. Select "Explore this show" and "Upcoming," then choose the showing that is most convenient for you to record. All recorded shows appear in your "My Shows" list, which you can access simply by pressing the TiVo button on your remote control twice!